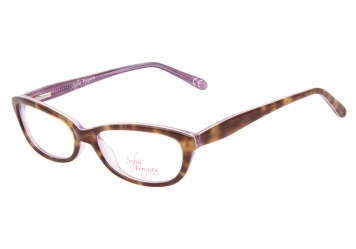 Now you can try on these Sofia Vergara Peppi TPR eyeglasses online using your computer. Right here on ViewTry you have the ability to see what you look like wearing these exact frames just by turning on your webcam. This pretty cateye frame features a bright blond tortoise exterior and soft crystal lavender interior for a playful combination. Now is your chance to virturally try on these Sofia Vergara eyeglasses right now. Enjoy the experience.